Home Health Blood Type diet … Is it worth it?! Blood Type diet … Is it worth it?! 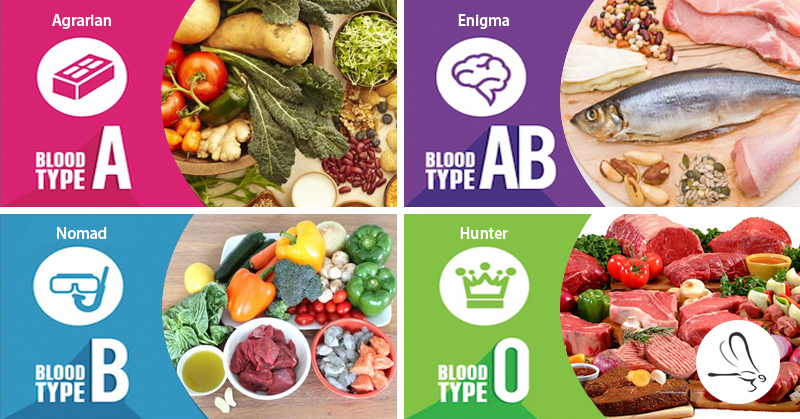 The blood type diet theory was originated from the naturopath Peter J D’adamo, in his book “Eat right for your type”, D’adamo claims that there is a chemical reaction happens between the food you eat and your blood type. The reaction is caused by a factor called “Lectins” some sort of proteins found in foods, which have agglutinating properties that affect your blood. According to D’adamo, that following diet designed based on your blood type, will help your body digest food more efficiently, lose weight and prevent some diseases. Allowed Food: Red Meat, Poultry, Fish and Vegetables. Limited Food: Dairy, Legumes and Grains. Avoid in weight loss purpose: Eggs, Gluten, Wheat, Corn, Kidney beans, Havy beans, Lentils, Cabbage, Cauliflower, Mustard greens. Allowed Food: Vegetables, Seafood, Grains, Beans, Legumes, Nuts, Rice and Fruit. Avoid in Weight loss purpose: Red Meat, Orange, Dairy, Kidney Beans, Lima Beans, Wheat. Appeared from 10,000 years BC. Where man left Farms and started spreading on different lands where he also started tending and rearing sheep and cattle. So there diet started to focus on Dairy and balanced between protein and vegetables. Allowed Food: Meat, Fish, Dairy (Low fat), Beans, Legumes, Vegetables and Fruit. Avoid in Weight loss purpose: Corn, Lentil, Peanuts, Sesame, Seeds, Buckwheat, Sunflower, Tomato, Chicken and Wheat. Appeared recently from 1,000 years only, D’adamo believes that this type has helped people to undergo to the modern era, where people with this blood type have the ability to mix between the two types A and B foods. And to have a balanced diet between Vegetables and Dairy. Avoid in Weight loss purpose: Red Meat, Chicken, Beef, Shellfish, Kidney Beans, Lima Beans, Seeds, Corn, Smoked and cured meat, Caffeine and Buckwheat. Helps in weight loss: Seafood, Dairy, Grains, Kelp, and Pineapple. At the end this is considered a Fad diet, with no scientific or clinical evidence behind it. It’s likely that you would lose weight, though, because the diet can be very restrictive. Previous articleBreakfast has never been this EASY!